This book is part of a small series by R. C. and is an exposition of Luke's gospel. The work is aimed at the layperson so is not weighted down with scholarly research. While not delving into the Greek on a regular basis, there are many insights into the text that I found inspiring. It makes a nice devotional read as one goes through Luke's account. A Bible alongside is not even necessary as R. C. has most of the Scripture account in the text. Geert Mak traveled through Europe in 1999, visiting cities that played in the major events of the twentieth century. He had been commissioned by his paper to do so and his articles appeared daily on the front page. His travels followed, as much as possible, a history in Europe. In this book, each short chapter centers on an historical event of that city with additional comments on the city today. In Helsinki, Lenin’s train ride from Finland is recounted. In Petrograd, we hear of the crushing of 720 major and minor revolts in one year. The old section of St. Petersburg is essentially frozen in 1917. Tied in t o Mak’s visits to Berlin and Bielefeld is a concise yet excellent account of the rise of the Nazis and how Hitler finally became chancellor. While in Predappio, where you can still buy Nazi and Fascist memorabilia, Mak writes of Fascism and its areas of similarity (and difference) to Nazism. At Auschwitz, the stories he recounts are depressing. He ponders how much the Germans knew and who turned their heads to the awful truth. He also tells very encouraging stories of people who helped thousands of Jews escape. Reading of the actions of the French during WW II is depressing. A bright light in the darkness were the resistance fighters. After the war, almost all French collaborators were granted amnesty with many eventually rising to power on deGaulle’s post war government. Surprising to read about was the Allied practice of bombing residential areas. The aim was to lower German morale but hundreds of thousands of civilians died in the process. About two thirds of the book deals with the first half of the twentieth century. For someone like me who was born at the end of that period, the extended descriptions of WW I and WW II are welcome. Our forgetfulness is perhaps the reason I found this book so valuable. We need to remember. We need to again encounter the first person accounts of our past. Born and raised in the U. S., In Europe helped me to understand what Europeans have experienced in this last century. I highly recommend the book. It’s big at 829 pages, but at 20 pages a day you can cruise through the book in a little over a month. Something is wrong with the corporate world today. With an exclusive focus on external results, the inner life of the individual and the corporation has been forgotten. The inner strength erodes while the outer appearance, for a time, still shows life. Like a tree dying at its center, it may appear healthy until a strong wind blows it over. The answer to our current situation, Benefiel says, is the path of soul-based leadership. There is a necessary place for spirituality in the corporate world. Corporate leaders can and should lead based on values rather than merely the bottom line. The corporate world can return to concern for the well-being of the worker and the customer in addition to profit. Benefiel gives the reader several examples of individuals who have followed the path of soul-based leadership. Using their examples as well as an increasing amount of literature, Benefiel suggests a leader begins on the path by listening to his or her own heart. A decision is made, steps are taken, and stumbling occurs. The leader finds partners to help. Benefiel covers the additional soul-based leadership practices of keeping the mission at the fore, practicing gratitude, battling for the soul, and breaking the cycle of violence. At the end of her book, after the reader is convinced soul-based leadership is necessary and possible, Benefiel explains the process of spiritual transformation. Since the current culture ignores the inner reality of the soul, many corporate leaders might not know how to develop spiritually. Benefiel focuses on the classic Christian formulation of the three ways to describe the process. “The three ways - the purgative way, the illuminative way, and the unitive way – describe the journey of the spiritual sojourner from an initial spiritual awakening through many ups and downs all the way to union with God.” (P. 142) The process is not linear (one never “arrives”) but is more like a spiral of repeated and deeper experiences. The developmental process can be applied to corporations as well as individuals. Not matter what kind of leader you are you will benefit from the admonition and encouragement in this book. Spiritual leadership is necessary for organizational effectiveness. Leaders need to pay attention to their souls and Benefiel’s book is a great place to get started. Cassandra Higgins, daycare provider and mother of four boys, buys a snow globe at an collector's convention. The little girl and three dogs bring back memories of her childhood. There are good memories of a grandfather who was understanding and support. There is the troubling memory of being forced to give up a found dog to a pound because her mother said they could not afford to care for it. One night, as Cassandra contemplates the globe, the snow inside swirls and the figures disappear. Cassandra's life swirls as she tries to understand her relationship with her mother, the impact of the suicide of her father when she was a child, and dealing with her lost dream of becoming a veterinarian. Cassandra's husband Ken thinks giving her a dog for Christmas is a great idea. But will it help her heal or will it bring up too many hurtful memories? Stray Affections is a great book for dog lovers and a light read for winter evenings. Whaley says there is a prevalent lack of biblical understanding of worship. “People all over, from pew to pulpit, have heads full of misguided notions on the kind of worship that pleases God.” (Page xvi) This generation of evangelicals needs a firm grasp on the principles of genuine worship. Whaley travels through the Bible to identify the guidelines of worship that pleases God. The creation narrative reminds us man was created for worship. From Israel’s history and the writings of the prophets we find brokenness is a prerequisite for genuine worship, obedience is at the very center of worship and real worshippers demonstrate personal integrity. From the New Testament we find that true worship embraces love for the people of God, sh own by service. At the end of each chapter, Whaley offers practical suggestions to guide the reader to a lifestyle of worship. He reminds us we are in a battle as we fight idols seeking our worship. Our practice of God pleasing worship will culminate in the perfect worship of heaven as seen in the book of Revelation. A couple of positive aspects of the book include Whaley’s knowledge of Hebrew and Greek. He helps the reader see the many aspects of true worship through the various words used to describe it. Also, if you have even wondered how to use the Psalms in daily worship, Whaley gives a week of devotions as an example. Overall, I would recommend this book as sorely needed to get to the foundation of what it means to truly worship God in a manner He finds pleasing. This book would make a great study tool for worship leaders, pastoral staff, Sunday School classes or small groups. The adventures continue in this second in the Sweetgum Ladies Knit Lit series. A new member is added as one has moved away. Each of the women face trials in their love life. Will love conquer fear? Will love triumph over past hurts? Will one woman follow her dreams? I won't give away the story lines as the women come to grips with their own problems while helping others in the group. A nice summer read with a little food for thought thrown in. It is rare that I give up on a book. I slogged through this one to over half of the original (Cecil's) text and just had to give up. 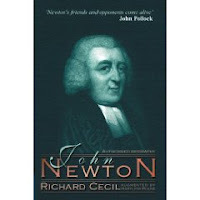 Newton's own narrative is interspersed with Cecil's biography. And then there are the Appendices placed at the end of each chapter. Reading this book is like reading a few paragraphs from one 18th century author, then another, then a few notes about the previous sections. It is very hard to follow. Some of the notes deal with people who knew Newton and are more about those individuals than Newton! I am very disappointed in Rousse's editing job. She could have done a much, much better job of rearranging the material to make it flow in a readable fashion. The language is awkward and hard to understand. A little editing in updating the language for today's reader would have helped also.Cecil"s "authorized" biography was written within a year or so of Newton's death. Perhaps, as it was published so soon, Cecil seems to have deliberately glossed over Newton's life while captain of a slave trading ship. Except for a minor allusion, one would have thought Newton's ship was one carrying spices or something. (One needs to remember his being captain of a slave ship was after his "conversion" during a severe storm at sea. )If you are a scholar and are looking for first sources, then perhaps you will appreciate this book. If you want a readable book on John Newton's life, by all means skip this one. At this time in which we live, it is hard not to fear. We fear that we do not matter and that we are unimportant. Though we are Christians, we fear we have or will disappoint God. We worry despite Jesus’ command not to. We fear for our children: their safety, their health, their future. We fear being overwhelmed by the events of life. We fear the worst is going to happen. We fear violence or a violent death. We fear for our financial future. We fear how our life will end and what will happen to us. We fear what the next surprise in life might be. We fear that God is not real. We fear global calamity. Max Lucado uses Scripture and encouraging stories to address each of these fears. We tend to forget that we were made by God and are loved by Him. His love is perfect. His presence is with us. We forget that our children, our possessions, our health, our money, everything we have belongs to God. We forget that God provides for us and He asks us to trust Him for our well-being. We forget that Jesus faced His fears in the garden with prayer. We forget that Jesus comforted his fearful disciples with His bodily presence and that we can find that same assurance in His body, the church, today. We forget that God is sovereign and world events serve His purposes. Lucado encourages us to place all our fears in the hands of God except one. We fear God won’t stay in the box in which we have put Him. Count on it. He won’t. Plan on encountering the God Whom you should fear with awe, reverence and respect. This book would be a great study for a small group. For such a use, a 38 page discussion guide is provided at the end of the book. These are troubled times but we are not to fear. Lucado helps us fight our fears by putting our faith in action through relying on the promises God has made to us. Stearns identifies what his book is about at the very beginning: “What does God expect of us?” It is a simple question but, as Stearns says, the answer is not so simple. “God asks us for everything. He requires a total life commitment from those who would be His followers.” (P. 1) Being a Christian entails a public and transforming relationship with the world, not just a personal and transforming relationship with God. Stearns weaves his own story into the book. He was a successful Christian, CEO of Lenox, and driving a Jaguar to work. He received a call in January of 1998 from people at World Vision who were looking for a new president. He struggled with the call but ultimately accepted. Previous generations were not aware of world wide needs. Loving their neighbor meant immediate neighbor. Now we can see the suffering around the globe. “And yet only about 4 percent of all U. S. charitable giving goes to international causes of any kind.” (P. 102) Part of the problem concerns the news media. An airline crash in the U. S. or the latest movie star divorce are headline news while the 26,575 children who die daily from largely preventable causes related to poverty go unnoticed. Stearns notes that the church has a poor record regarding injustices in the world. Slavery was not opposed by the church (as a whole) for hundreds of years. The church was also missing in the 1950s and 60s regarding the issue of segregation. We might wonder how the church stood by when great atrocities occurred in the past. Are we doing the same today by ignoring the poor and hurting in less developed countries? Is our lifestyle consistent with our faith values? The average giving of church members in 2005 was under 3% of their income. Of the money that is given to churches, only 2% goes to overseas ministry of any kind. “If every American churchgoer tithed, we could literally change the world.” (P. 218) There would be an additional $168 billion for use in ministry to those in need. Suzanne Strempek Shea grew up Catholic and attended services regularly. The combination of the sexual abuse stories of various Catholic priests and being diagnosed with breast cancer at age 41, made her revisit her childhood faith. She still went to church, but only when the church was empty and silent. Seeing the wake of Pope John Paul II, she decided to go on a spiritual pilgrimage of sorts, visiting other churches. Despite being taught as a child that the roof would fall in (or worse), Shea visited fifty churches in a year of Sundays (and a couple of Saturdays). She attended many churches in her area of Massachusetts and also relied on the specials at Southwest Airlines to attend th ose at a distance. Her experiences? She heard a sermon to boycott Wal-Mart at Trinity United Methodist Church of Christ, washed feet at a Seventh Day Adventist Church, sat with thousands listening to Joel Osteen give a 28 minute (TV restriction) talk on weight loss, was fascinated by speaking in tongues, sat in a church totally ignoring the needs of Katrina victims (only 60 miles away), listened to Rick Warren in his typical Hawaiian shirt, and many more. Her conclusions? Shea didn’t like the glitz, the show, the well orchestrated service. Instead, she was impressed with the simple service, with the heart of people helping others, with genuine hugs, and with people truly living out their beliefs. She visited what, in my mind, were pretty strange churches. Some could hardly be called “Christian.” Others had only a few attendees and rows of empty seats. Some had sterile, modern buildings while others showed an appreciation of traditional art. While I am troubled by the spirituality of Shea, her observations of the churches she visited were very interesting. Ever wanted to know what a stranger would think of your church service? Read Shea and get a pretty good idea.